Today a transcript was released of an interview featuring Randy Cramer (aka Captain Kaye) who claims to have spent 17 years on Mars in the initial phase of a 20 year tour of duty from 1987 to 2007 with a secret space program. 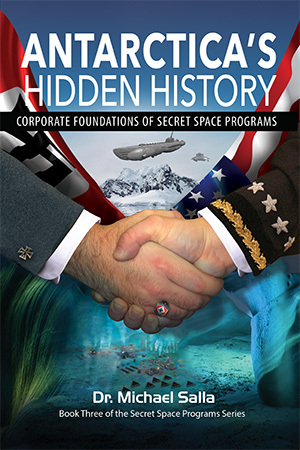 The transcript of the interview conducted on April 8, 2014, makes it possible to more easily compare Cramer’s claims with that of another more recent whistleblower, Corey Goode (aka GoodETxSG), who also says he spent time at secret bases established on Mars during his own 20 year tour of duty over the same time period with another secret space program. A comparison of their testimonies shows consistency in their respective claims of secret bases on Mars run by corporations. Most surprising is that their claims of Mars having a breathable atmosphere hospitable to small animal life and vegetation, is supported by NASA’s own Mars orbiter and rover images. My understanding is that we were on Mars the very first time around the mid-60s, but really didn’t try to do anything serious, or really prepared to do anything with that until the 1970s. My understanding is that our first exploratory mission that was sent there to stay any length of time was 1970. Then after a few years it was decided that we were ready to go ahead and establish a Mars Colony Corporation foothold, and set up a few settlements and attempt to do some mining, and extract some resources to make it pay for itself. Apparently that was about 1975, when the Mars Colony Corporation set foot on Mars and started its first mining operation. If Cramer is accurate, the situation on Mars is therefore analogous to the scene depicted in the movie Avatar – a corporate conglomerate runs mining operations on a moon, Pandora, using contracted military personnel as its own private army. The way Cramer and his division was told to treat the native Martian inhabitants who used minimal advanced technology, again was very similar to Pandora. The native Martians would be attacked if they interfered in any way with the mining operations of the Mars Colony Corporation. 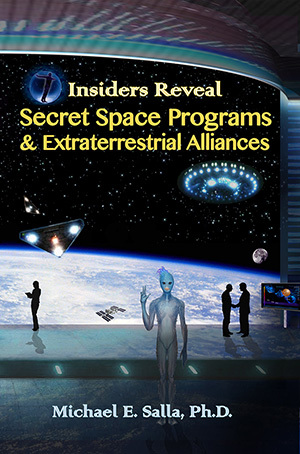 The emergence of private companies to take over significant aspects of secret space programs is a logical development of the secrecy surrounding these programs. The massive funding necessary for establishing and maintaining off-planet space programs cannot come from the normal appropriations process used by the US and other national militaries. The latter have to answer to lawmakers in their funding requests, and typically have to deal with public scrutiny of their “official black budget” funding of classified programs through the Department of Defense. In 2013, Edward Snowden released NSA files revealing that the black budget used to fund the intelligence community and classified programs was $52.16 billion for fiscal 2013. The large scale funding required for establishing bases on Mars, or other celestial bodies, would far exceed the $52 billion “official black budget,” and require going outside the normal Congressional funding process to maintain secrecy, at least in the USA. A 2003 report revealed a second “unofficial black budget” and estimated it to be an astounding average of $1.7 trillion per year from 1998-2000, At the time, that was more than five times the entire budget for the Department of Defense which in 2001 was $291 billion. The “unofficial black budget” is almost certainly likely used to fund secret off-world programs such as Mars, the moon and elsewhere. Companies taking over various aspects of secret space programs could do so without legislative scrutiny and oversight. As long as the companies controlling mining and other aspects of secret space programs could make profits on such activities, then stock holders would be unlikely to pose any long term problem. If Corey Goode’s testimony about the existence of the Interplanetary Corporate Conglomerate is accurate, then it appears that many classified space activities and assets are already being exploited for profit. According to NASA, Mars atmosphere is 95% carbon dioxide with only a trace amount of oxygen 0.13% – not enough to sustain life. On October 14, 2014, NASA’s MAVEN spacecraft, released data about oxygen being released from Mars upper atmosphere into space. 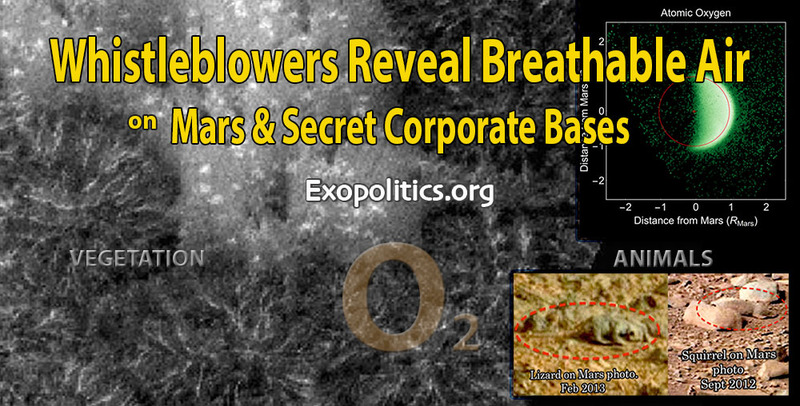 According to NASA, this oxygen is due to the breakdown of water and carbon dioxide molecules in the upper atmosphere. Another explanation is that oxygen is being produced on Mars surface by vegetation that varies in size with the seasons, and whose oxygen eventually dissipates as it rises. 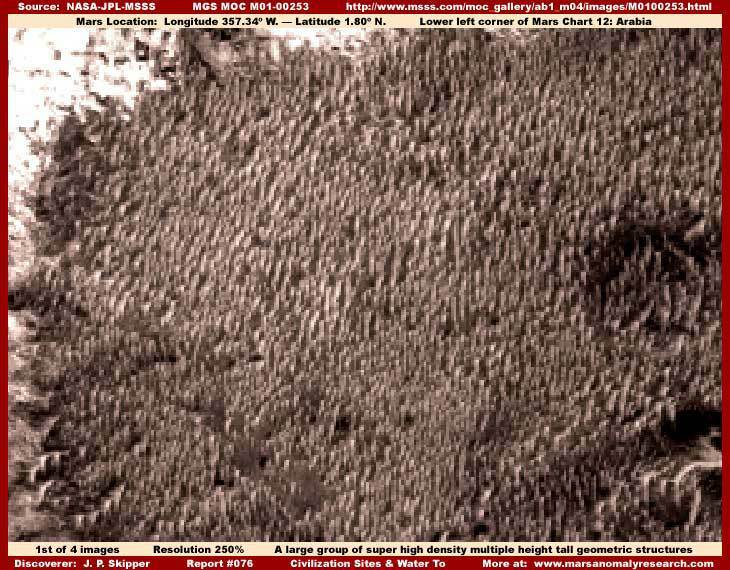 Van Flandern also revealed the strong opposition to him publishing his findings in peer reviewed scientific journals – a clear way to minimize the ground breaking results that there was photographic evidence of life on Mars. Despite Van Flandern’s professional standing in the astronomical community, NASA and the scientific community ignored his pioneering research revealing vegetation on Mars that fluctuated with seasons. There have been a number of Curiosity Rover images that appear to show small animals on the surface of Mars such as lizards, squirrels and even ducks which helps confirm Goode’s claims of small wild life and vegetation. The Curiosity Rover images support Cramer’s and Goode’s claims that Mars has a thin breathable atmosphere. Perhaps, most importantly, their testimonies and Curiosity Rover images confirm that Mars surface is producing oxygen, whose levels fluctuate with the seasons. The oxygen eventually finds its way into the upper atmosphere before being dissipated into space. The oxygen observed by the MAVEN spacecraft is therefore not exclusively a result of the breakdown of water and carbon dioxide, but also due to Mars fluctuating surface oxygen levels. … there’s a period of time for maybe 15 or 20 minutes depending on the season when the sun is dropping below the horizon and it goes from red to purple. For about 15 mins everything turns this amazing shade of purple. Again, this matches with Goode’s experiences on Mars. The sky was a light blue to lavender and pinkish especially during sunset when there wasn’t a lot of dust in the upper atmosphere (which occurred frequently when we were on the surface). To date, there has been no hard evidence or documentation to substantiate Randy Cramer’s claims. In his interviews he appears sincere, consistent, and attentive to details in the experiences he is describing. Furthermore, his testimony has similarities with other Mars whistleblowers who have come forward such as Michael Relfe and Corey Goode. In particular, the similarities with Relfe’s and Goode’s testimonies suggest that one or more secret space programs exist where personnel are recruited for 20 year tours of duty, before being returned to normal civilian life through age-regression and time travel technologies with their memories removed. It’s highly unlikely that Cramer is making up his testimony, but there is a possibility that some of his “recovered memories” are implanted screen memories designed to mislead him and others about various aspects of secret space programs. It’s possible that genuine information is mixed with false screen memories in Cramer’s revelations about secret bases on Mars. This is certainly what I believed about Cramer’s bizarre claim of having experienced two head transplants while serving on Mars, until I learned that such a medical procedure is viable and will be soon attempted.